The Tides of Time - ZineWiki - the history and culture of zines, independent media and the small press. 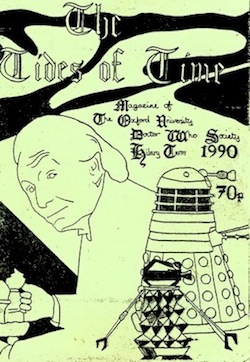 The Tides of Time is a media science fiction fanzine published by the Oxford University Doctor Who Society. The first issue was published in the UK in January 1990, and was edited by Louise Dennis, who continued as editor to Issue 7. released in January 1992. Contributors of writing to these issues included James Brough, Jonathan Bryden, James Cannon, Simon Clifford, Louise Dennis, Paul Dumont, Mark Dunn, Gabriel Finch, Evariste Galois, Paul Groves, Michael Hagan, Matthew Kilburn. Robert Moss, Ben Murphy, Graham Pointer, Tim Procter, Roger Shaw, Adam Stephens, and Sarah Sturch. Fiction was by Louise Dennis, Paul Dumont, and Alan Whitten. Poetry was by Matthew Kilburn, Comic strips and cartoons were by Louise Dennis, and Paul Groves. Cover art was by Louise Dennis (#1), Paul Groves (#2, #6), Liz Humphrey (#3), Matthew Kilburn (#7), Robert Moss (#4), and Muzibur Rahman (#5). Other art work by Mike Collins, Louise Dennis, and Robert Moss. Issue 8 was released in 1992, and was edited by Julian Mander, who continued as editor till issue 11, published in 1993. The cover photomontage was by Julian Mander. Contributions of writing to these issues came from James Brough, Terry Cesa, Louise Dennis, Matthew Dovey, Stephen Drape, Paul Dumont, Ian Fellows, Paul Groves, Mark Hanlon, Matthew Kilburn, Gordon Lethbridge-Stewart, Julian Mander, Gary Meehan, Adam Stephens, and Alison Taverner. Fiction was by Paul Groves, Matthew Kilburn, Julian Mander, S’Talisha, and Alan Whitten. Cartoons and comic strips were by Jeremy Dennis, and Paul Groves. Filk songs were by Matthew Kilburn. Issues 12, published January 1994, was edited by Paul Fisher, with deputy editor Gary Meehan. Contributors of writing included Stephen Drape, Ian Fellows, Paul Groves, Mark Hanlon, Ryan Hemage, Paul Lee, M.J. Ritson, and Anthony Wilson. Fiction was by Gareth Cornell. Filk song was by Ian Fellows. Issues 13, released 1994, to 16, 1995, were edited by Gary Meehan, with David Steele as co-editor on 13, James Brough and Mary Brady for 15, and Corrine Berg on 16. Contributors of writing to these issues were Corinne Berg, James Brough, Steve Drape, Paul Dumon, Leo V. Gaspur, Paul Groves, Ryan Hemage, Matthew Kilburn, Paul Lee, Gary Meehan, D. J. Steele, Adam Stephens, Sonia Thynn-Owl, and Anthony Wilson. Fiction was by Corinne Berg, Mary Brady, Ian Fellows, Brenda Foulkes, Anthony Wilson, and John Wilson. Cover art for issue 15 by Mary Brady. Issues 17, published April 1994, to issue 19, from June 1996 were edited by Corinne Berg. Anthony Wislon was co-editor for issue 19/ Contributors included Mary Brady, James Brough, Louise Dennis, Paul Groves, Matthew Kilburn, David Lee, Gavin Llewellyn, Gary Meehan, Matthew Peacock, Robert Priddey, Tim Rickman, Anthony Wilson, John Wilson, and John W.G. Wilson. Fiction was by Corrine Berg, David Bickley, Mary Brady, Paul Groves, Ryan Hemage, Pierre Lefevre, Alan Whitten, Anthony Wilson, John Wilson, and John W.G. Wilson. Issue 20, from 1997, was edited by Sandy Starr, assisted by Domi Starr. Contributors included David W. Battle, Al Harrison, Matthew Peacock, Domi Starr, and Sandy Starr. Fiction was by Al Harrison. Issue 21, from February 1998, was edited by Matthew Peacock, who continued as editor to issue 23, dated 1999. Contributors to these issues were Alex Ball, David Bickley, Alice Dryden, Penny Goodman (on Hercules: The Legendary journeys), Alastair Harrison, Derek Haywood, Dave Howdon (on Babylon 5), Matthew Kilburn, Fiona Moore, Matthew Peacock, Robert Priddey, Matthew Stanton, Sandy Starr, and John Wilson. Fiction was by David Bickley, Alastair Harrison, Derek Haywood, Matthew Peacock, Alasdair Prett, William J. Ramsden, Caroline Steventon, and Alan Whitten. Issue 24, of June 1999, was edited by Alastair Harrison. Contributors were David Bickley, Alastair Harrison, Fiona Moore, and John Wilson. Fiction was by Alice Dryden, and Alan Whitten. Issue 25, from 2000, saw the return of Matthew Peacock as editor, until issue 28, from October 2002. Contributors for this period are John Amos, David Bickley, Mark Boyes, George Cormack, James Davies, Sian Davies, Alastair Harrison, Derek Haywood, Emma Keevil, M. Khan, Matthew Kilburn, Darren King, Fiona Moore, David Morse, Alasdair Prett, and Daniel Saunders. Fiction was by Alexandra Cameron, Derek Haywood, Matthew Peacock, William Ramsden, Alan Whitten, and John Wilson. Issue 29, March 2004 is edited by Matthew Kilburn, who continues as editor till issue 31, of November 2005. Contributors for this period are Laura Brough, Dan Blythe, Alex M. Cameron, James Davies, Paul Dumont, Rei England, Dewi Evans, Paul Groves, M. Khan, Matthew Kilburn, Alex Middleton, Daniel Saunders, and Sophia Woodley. Fiction is by Alex M. Cameron, and Sophia Woodley. Cartoon is by Alex M. Cameron. Issue 32, of 2006, is edited by Adam Povey, who continues to issue 36, of Summer 2012, as editor. Contributors from this period include Sara James, Adam Kendrick, Thomas Keyton, Matthew Kilburn, Emma Lewis, Jonathan P. Martindale, Jonathan Nash, Adam Povey, and Katrin Thier. Song lyrics were contributed by Thomas Keyton. Art work was contributed by Francesco Francavilla. Photographs were by Sara james, Rebecca Logan, and Paul Seaton. Issue 37, of 2013, is edited by John Salway. Contributors to this issue include Graham Cooper, Sara James, Adam Kendrick, Thomas Keyton, Matthew Kilburn, and Jonathan Martindale. Issue 38, released Summer 2016, is edited by Daniel Alford. Contributors include Matthew Kilburn, Alex Middleton, Andrew O'Day, John Salway, and Katrin Thier. Issue 39, from June 2017, is edited by Matthew Kilburn. Cover illustration is by Sam Sheppard. Contributors are James Ashworth, James Baillie, Melissa Beattie, Louise Dennis, Matthew Kilburn, Tom Marshall, William Shaw, and Katrin Their. Fiction is by Matthew Kilburn, and John Salway. Poetry is by William Shaw. Photographs are by Melissa Beattie, Georgia Harper, and Matthew Kilburn. Issue 40, also from 2017, is also edited by Matthew Kilburn. Contributors include James Ashworth, Ian Bayley, Rogan Clark, Louise Dennis, Beth Graham, Georgia Harper, Matthew Kilburn, Peter Lewin-Jones, William Shaw, and Sam Sheppard. Fiction is by Nathan Mullins, and John Salway. Song lyrics are by John Salway. Illustrations are by Matthew Kilburn, Lumos5001, Orchideacae, and Sam Sheppard. Photographs by Louise Dennis, Paul Dykes, Matthew Kilburn, Sam Newman, Carole Raddato, and Gage Skidmore. Writing from The Tides of Time, along with fanzines such as Burnt Toast, Enlightenment, TARDIS, The Whostorian Quarterly, and others, appear in the fanzine anthologies, Time Unincorporated: The Doctor Who Fanzine Archives, 1, 2, and 3, edited by Graeme Burk and Robert Smith, and published by Mad Norwegian Press in 2010. This page was last modified on 26 January 2018, at 20:21.